Plugin add labels from fas file. If the file has ext. <exename>.fas - plugin loads it automatically. Otherwise suggests to choose it. I found bug with local variables. Ann add check for negative offsets. And also check on values it is less tha imagebase. But this decision does not please me. Probably, I do something not so. Tell, how I can distinguish the labels necessary to me from dust? Now plagin work - But correctly??? Is there any way to use it with a new version() of olly? H? Only hack of olly2. But I now do not have free time. Maybe later. I'd prefer not to always state implicit things, eg. "call [SetThreadPriority]", instead of "call near [dword ds:<SetThreadPriority>]"
I do not understand, that you want. Specify please. And when you use this plugin you can push Ctrl+G and print <start>. And olly place you at this label (if you use this label in you source). 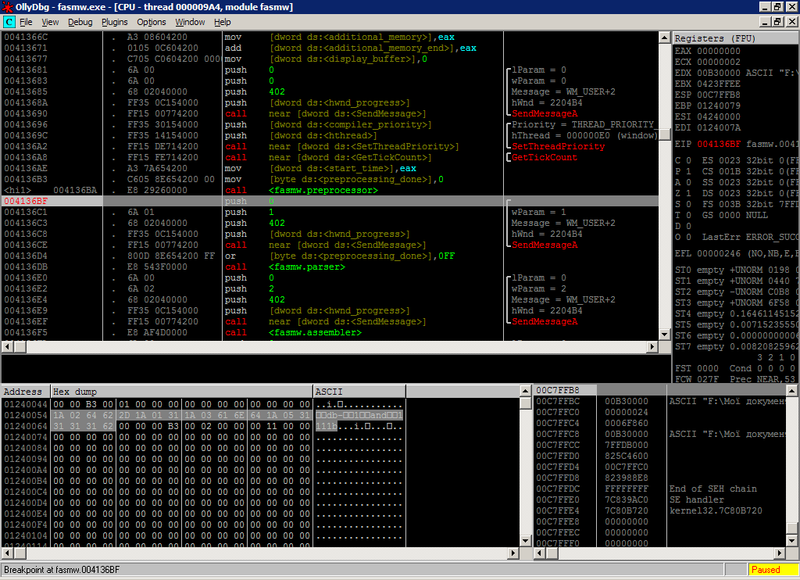 how can change this, that radasm compile exe with debug symbols aka fasm -s c:\123.fas c:\123.asm ? I have just tried this plugin but Olly 1.10 crashes. I have loaded the "dialog.exe" shipped with FASM and press on "Get Labels" in the plugin and selected "dialog.asm" and it crashes. How should I use this plugin? in the plugin and selected "dialog.asm" and it crashes.! Thanks Z3N! I missed that! I remember that when debugging with SoftICE I could see the whole MASM source code inside SoftICE (even my comments, etc) and trace it over it. Isn't that possible under Olly? That is, Olly disassembly output is changed to match the same text code that I have written and trace over it. Isn't that possible under Olly? That is, Olly disassembly output is changed to match the same text code that I have written and trace over it.! It's possible in olly1.10 and with exe produced by masm. I don't know how anyone olly func whish allow "bind" source lines with binary code. I'am try convert fasm debug info in pdb, but I don't have much time. Thanks for the great share , I can not get this pulgin to work???? what am I doing wrong??? and I tried to click on "Source" in OllyDBG and it is empty.... is there a special way to configure ollydbg settings??? This plug-in doesn't add source-level debugging capability. As you may see on your screenshot, labels from .fas were loaded (you won't see them on the left if address column is too narrow though). heatherfox07, maybe my screenshot is what deceived you. The plugin which adds source code information from .fas is still under developement. Hope to finish it soon.